We are very blessed with some very incredible aspects of the Israeli education system. Not all of it is perfect. In fact, there are some real challenges, but here is one situation when they get it right. There is a strong drive for early intervention, in this country. There are systems built to monitor how kids are developing, such as Tipat Chalav (Well Baby Clinic), there are centers designed to help early age development with therapies, Hitpatchut Hayeled (Child Development Center) and then they have school integration programs. This year, a new program has started where 6 children are selected from every preschool, to receive integrated therapy programs during school hours. It will help kids along that are otherwise lagging behind in occupational therapy, speech therapy and any other development challenge. Without a blink of an eye, Tehilla's teacher asked for Tehilla to be one of the kids, given her long medical history and of course, without hesitation, I signed the papers. I just met with Esther, her new integration teacher. She told me, "As soon as I saw Tehilla, I felt there was something special about her. She has such a drive for life and such a big heart." I responded, "Her thirst for life is directly connected to her- not big heart, but her half a heart." Then I launched into a lengthy medical history. Her teacher will be helping her push ahead and has also asked permission to do Shiatsu message on her to heal her trauma and help her blood pressure. Power to ya, Esther. She begins on Sunday. 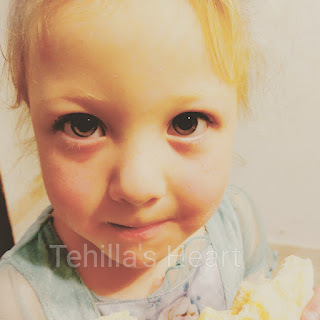 In everything else, Tehilla is doing great and loving life to the fullest. B'H!! Praises to His Holy name. I am so glad she is doing well.